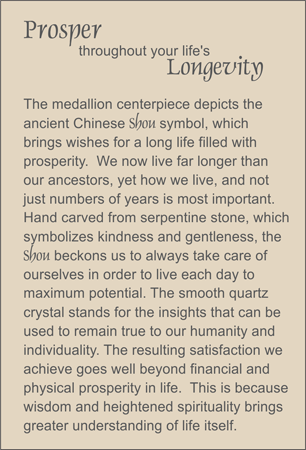 Longevity is the sentiment behind this necklace which features a natural serpentine hand carved medallion (4" L) depicting the ancient Chinese Shou symbol for long life and prosperity. Serpentine elements in the shapes of antique coins (boat-like shaped), sculpted flat hexagons and beads are set into trios of amethyst drum-cut rondelles flanked by bronze-colored freshwater cultured pearls (7mm). Sterling silver toggle clasp.